The University of Redlands School of Business held the Mentor Orientation & Mixer event last week to kick-off this year’s Mentor Program, which provides students with an opportunity for personal and professional development though the support of mentors. Christine Taitano, director for student services and Mentor Program manager, chatted with Katie Olson of U of R about how the program supports students’ academic and career goals. How do business students benefit from being involved in the Mentor Program? The Mentor Program helps students build their self-confidence, enhance their knowledge and skills, better define their career goals and options, and grow their professional network. Students in the program identify their goals and they work closely with their mentors on an action plan to attain those goals. In the last eight years, we’ve received feedback from students who have said that they’ve gained a better understanding of themselves and their capabilities, realized their career potential, and increased their self-confidence. Ninety-five percent of students said they had a positive experience in the program. Have there been mentees from the U of R program who have returned to mentor new students? Yes, we have a very high conversion rate of mentees who become mentors. 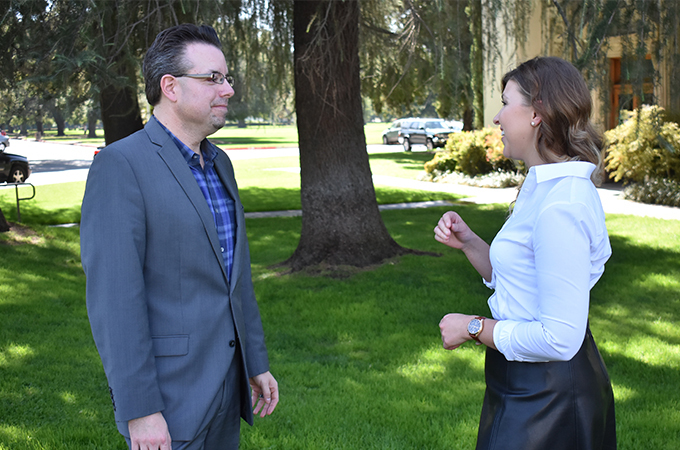 Approximately 90 percent of mentors in the program are University of Redlands alumni, and at least 15 percent of mentors were former mentees. Experiencing firsthand the benefits of the program, they return to pay it forward. In addition, 74% of our mentors this year are returning mentors. What is the difference between a mentor and a professor? What is the value in that difference? While professors focus on academia, mentors concentrate on their mentees’ professional development and career interests. In addition to the one-on-one mentoring, students may participate in employer site visits and mentoring mixers over the course of the seven-month program. During an employer site visit, students meet U of R alumni, tour the company facilities, and learn about hiring opportunities. . Some of the previous site visits have included Inland Empire Health Plan, LA 36, Renovate America, Mondelēz International, and Wiens Family Cellars. How are students matched with their mentors? We match students with their mentors based on their occupational areas of interest, career goals, and regional location. The program is available to students at all regional campuses within southern California. Students are required to meet with their mentor once a month during the length of the program. In the last eight years, 94 percent of participants said they had an appropriately matched mentor, and 90 percent maintained communication with their mentor after conclusion of the program. How have participants found success? Participants in the program have experienced success in various ways. This includes making valuable business connections and learning more about what it takes to succeed in an industry. Some mentees were in the right place at the right time and landed jobs. Others developed friendships and strengthened their professional network.